We picked this car up at the auto port in Oxnard, CA along with six Coopers, believe it or not that were going to a car show at Quest Field in Seattle. We had to go to some "special" part of the BMW building (BMW makes the engine in the F1) and they made a mechanic watch us load it. As I was driving it up the ramp of our enclosed transport trailer the guy kept begging me to be careful because they had just installed a new $12,000 clutch and they are only good for a few thousand miles. 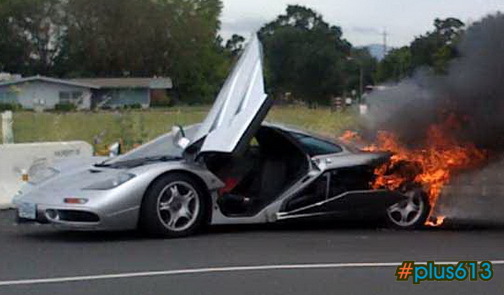 I think the owner bought the F1 for $1.6 million with something like 12,000 miles. I have pics of the inside of the car and of it in our trailer. Maybe I could post them if there are any F1 fans here. Anyway, we delivered the car to a guy just south of Portland who said he was just holding it for a friend of his attorney. We couldn’t get our 18-wheeler to the guy’s house so he had me drive the F1 behind him at a race car pace the 12 miles to his house. It was absolutely the chance of a lifetime to drive that car at 100+ mph on a winding Oregon and it was the best tip I ever got. Edited 1 time(s). Last edit at 27/11/2011 01:40PM by TimD.